My "oshogatsu" this year was quiet. I started off 2007 at a friend's house popping bottles of champagne and twirling noisemakers. Went home at 1am. Woke up the next morning at 8am and went with my mother to an annual New Year's Buddhist meeting in the San Gabriel Valley. We went shopping at the biggest and best Marukai in Gardena for last minute ozoni and osechi preparations and went home. My mom cooked the ozoni, which took no more than 30 minutes. 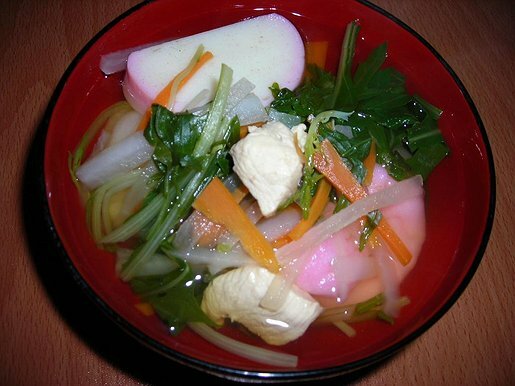 We had ozoni and slices of kamaboko together, watched some television and called it a night. I didn't track my 2007 oshogatsu as I would've liked to but did capture the ozoni making process and finished product. vkraus — Last modified Oct 11 2011 5:34 p.m.